From large watercolor maps of beloved destinations to petite paintings of landmarks and landscapes, artist Jules Smith captures the essence of place. An Alabama native, Jules grew up in Montgomery and graduated with a degree in architecture from Auburn University, where she enjoyed the benefits of studying under professors Bobby McAlpine and the late Sam Mockbee. Jules crafted her first map more than 25 years ago. At the time, she was looking for direction, not in a literal sense but in a spiritual way. “I drew a visual map of my mind and asked myself, ‘Where do I go from here?’” she recalls. As a young practicing architect, Jules had seen her projects published in Southern Living and Architecte Magazine. “I was afraid I had peaked early, ” she laughs. “But I knew there was a big world out there that I wanted to explore.” This desire inspired her next cartography creation—a nearly 2- by 3-foot rendering of the earth with historic coastal cities highlighted on every continent. Jules’ work did bring travel, but to Tennessee, Georgia, and Scenic 30A in Florida rather than far reaches of the globe. Several years ago, a chance meeting at a frame shop in Columbus, Georgia, turned into one of her most ambitious cartographic projects. “A couple was looking for a unique map of Lake Martin—but not the typical topo or fishing map, ” recalls Jules. After six months of meticulous research layering more than 73 existing maps, including Alabama Power and Corp of Engineer charts from the 1920s and the Congressional Land Description Method for scale, she created an engaging and beautiful rendition of what the region looked like before the dam was completed. She even noted abandoned hamlets and cemeteries that were relocated. Next came other locales, both near and far, that Jules drew as either commissions or labors of love. 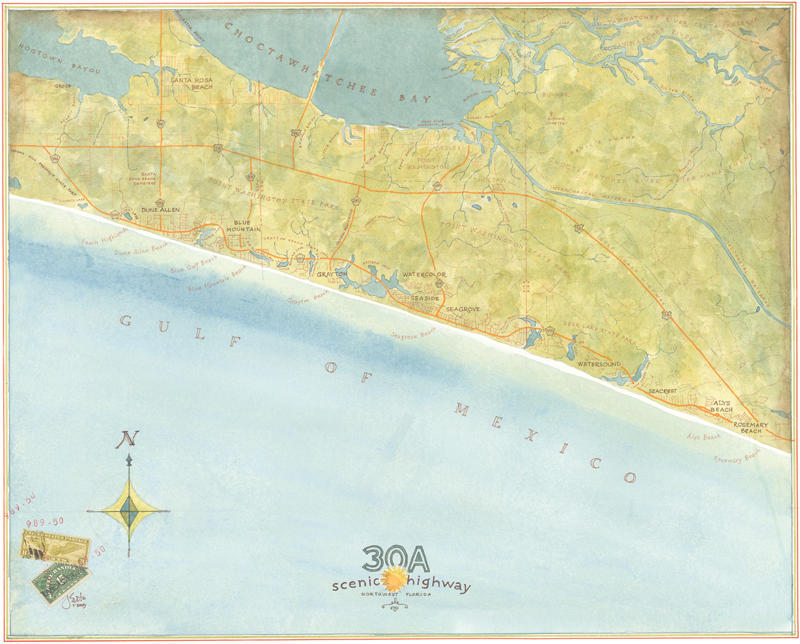 Covering destinations such as the South Pacific, Mobile Bay, the Greek Isles, and Scenic Highway 30A, her maps show the precision and accuracy of an architect in each and every stroke. But the beauty of these renderings resides in Jules’ personal interpretation of history and her artistic expressions in the overlays of textures and colors. With that format as a guide, Jules embarked on her collection of Petite Paintings, starting with the Seaside Post Office. “It’s the most photographed building in town, so it seemed like a natural, ” she explains. Each view is slightly different. Always playing with scale and proportion, Jules also paints single architectural details from other iconic 30A landmarks. 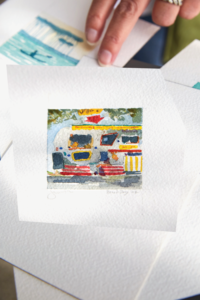 On the last day the Seagrove Village Market served lunch before it was scheduled to be demolished, Jules set up her easel in front, painting dozens of original views to freeze the moment in time. “I use old drafting tools like inking pens and lead holders that one finds in antique shops rather than in an architect’s office, ” she says. In this way, Jules is doing her part to preserve the things that foster the unique appeal of such beloved places, from Lake Martin and Scenic 30A to the far reaches of the earth. For more information about Jules Smith, visit watercolormapco.com.